i am sorry i have not written in you lately but i have been busy helping mom with an urgent makemergency. 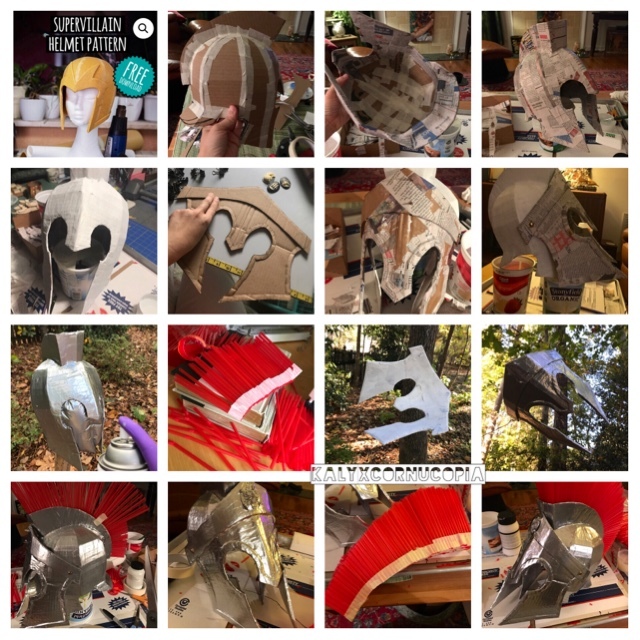 u see, little miss julia decided on sunday that she wants to be athena the goddess of war for trunk or treat on thursday and she asked if we could make athena's helmet. so we found a free basic villian helmet pattern on kamui cosplay, modified it to make it all spartany cool, cut it out of cardboard, and three very late nights later, we are almost done. it is coming along pretty nicely considering how little time we have to make it, dontchoo think? little miss julia wanted her helmet to be shiny silver which i think will be really cool bc sometime she can dress up as a roman cyclon. anyhoo, here is also a picture of me taking a break from all that makey. and nopies that is not a mega furry cat under me. let's just say if we were not so busy with our makemergency, my whole body would be a lot stinkier right now and not in a good way but more of a purple flower stink sort of way.